I’m nervously tracking my parents on a flight to Greece; I hate flying and so does my mother, but family reasons have forced her onto a plane. The plane tracker has lost sight of the aircraft because they don’t pick up data over the sea (they must be between Italy and Athens right now) which is making me uncomfortable. Usually I’d distract myself baking but I can’t fill the house with yummy smells because Ash will return from shul soon to begin his Yom Kippur fast. So it would be a bit mean. Instead, I’ll finally catch up on a post I meant to write an age ago. Yesterday was the wedding of my oldest and closest friend in the world. The girl I used to make forts under the duvet with, whose shoulder I cried on when lesser men than my husband broke my heart, who celebrated the good times with me (and cake). She looked beautiful and the day went without a hitch; we took some photos in a gloriously dry and sunny Hyde Park which I really look forward to seeing. But some weeks ago, before all this matrimonial celebration, was her hen do. Following on from mine, for which I requested an old-fashioned tea party, my friend Lizzie took the helm to create a themed party for the then bride-to-be, Em. Lizzie worked relentlessly and tirelessly for around two months before the day. I won’t give away exactly how she did everything as it’s not my work, but the photos in the post should give you a great idea of the fantastic attention to detail she demonstrates. 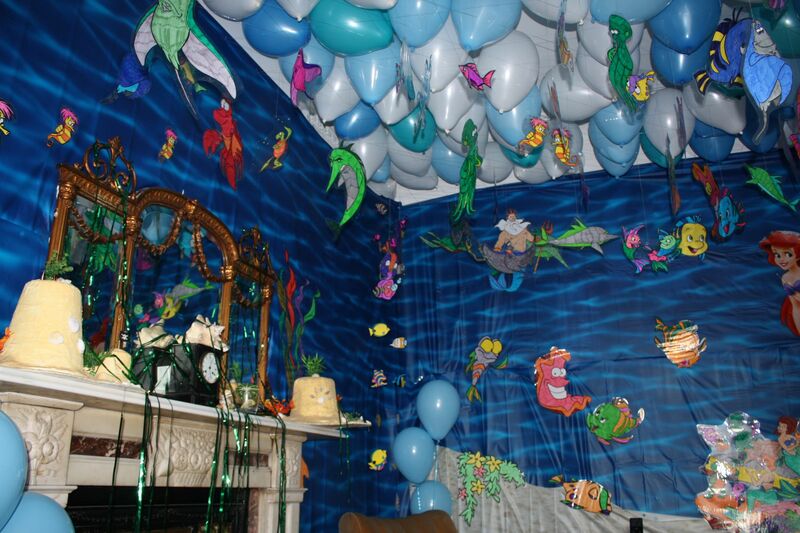 Every inch of the party area was lovingly converted into an under sea grotto, with characters from the film, sandcastles, seaweed, balloons, bubbles, shells and even a treasure chest helping to set the scene. The walls were hung with underwater and sandy bottom cloths, which made for a particularly fun treasure hunt, for which Lizzie wrote a pirate-themed set of clues. To complete the beside-the-seaside feel, the entertainment was a classic Punch and Judy show! The only part of all this wonderment I asked – and was allowed – to get in on was the baking action, and I was duly granted this task. Knowing Em loves chocolate, I dipped into Nigella’s classic How to be a Domestic Goddess and fished out the recipe for the supremely rich, muscovado-sugar packed Dense Chocolate Loaf Cake. 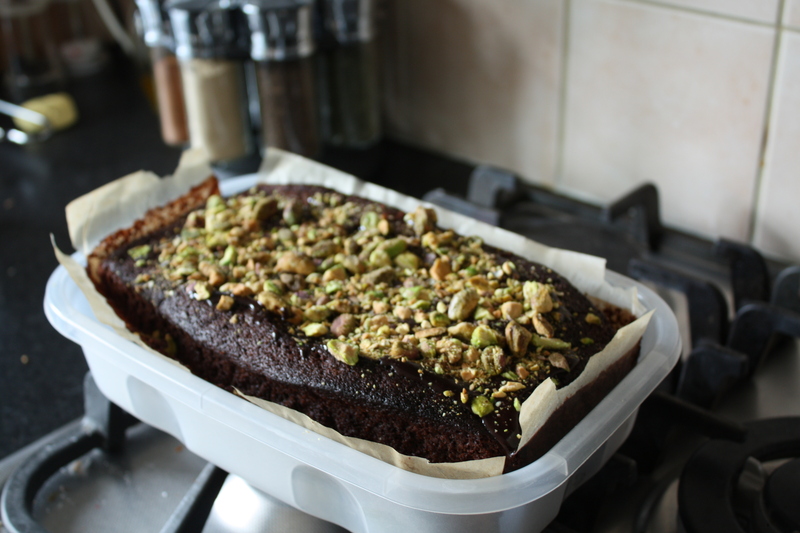 I then personalised it by whacking on some chocolate ganache and crushed pistachios (picture and recipe for ganache below as it’s one of my own / my mum’s). Alongside this was the more exciting part, using my brand new Wilton tin in the shape of cross-sections of mini wedding cakes! 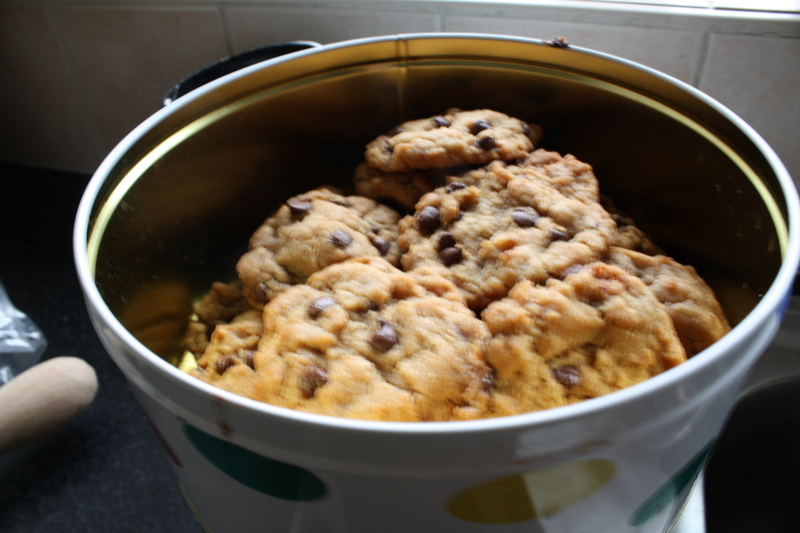 The cookies, by the way, were Levana Kirschenbaum’s kosher chocolate chip cookies – recipe online -, which were made vegan by substituting a heaped dessert-spoonful of vanilla (plain will do) soya yogurt per egg at Lizzie’s suggestion. It makes the dough much more crumbly, but if you persevere they will come out beautifully light, moist and chewy. Ash isn’t prone to exaggeration for all his love for me and he said he’d “pay for them”, so they must have been nice… Oh, and it goes without saying that the chocolate chips should all be plain and lactose free for vegan chums. Excuse the slightly fuzzy photo; I was shattered by then! Melt some butter in a reasonably thick-bottomed pan. For the loaf cake I used about a quarter to a third of a 250g block. To this I added two heaped tablespoons of cocoa plus the same amount of sugar. Stir constantly and swiftly and then start dribbling in a little milk at a time until the chocolate reaches a shiny, almost oily texture that drips from the spoon but isn’t runny. Taste a little (hot butter can burn, though, so be careful) and balance out the flavours as you prefer; the cake being very sweet I wanted a little cocoa bitterness to come through. While it’s still warm, pour over a completely cooled cake. 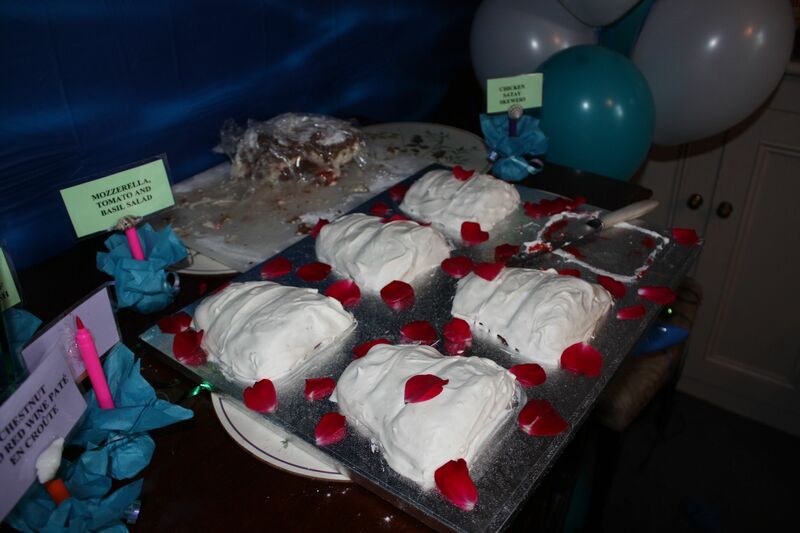 It’s a little uncontrollable which is why it particularly suited this cake which tends to sink in the middle. Before it had completely set I bashed the life out of some pistachios in a plastic bag with my rolling pin and sprinkled them on top. 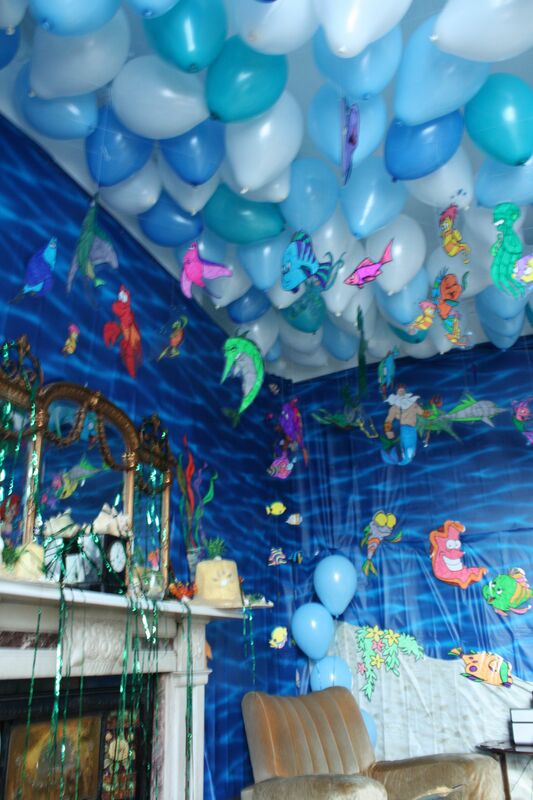 Hi there, i love the little mermaid party, looks so great! I was wondering if you could please tell me where you got the wall under water cloth? Thank you so mucH!! Hi there! Can you ask your friend how she did the characters from the movie? I cant seem to figure it out! thank you!